Since returning from our holiday a few weeks ago I’ve been struggling to make decent progress on FlickFleet. We’ve taken some impromptu holiday, had friends to visit and weathered a long baby cold which led to sleepless nights and hence curtailed evenings. This week I had a work trip to Manchester that was supposed to include a couple of nights in a hotel (it ended up being only one as a storm blocked all trains out of Newcastle on Wednesday evening). With six hours of train travel and an evening in a hotel I managed make a huge amount of progress. I’ve now finished the Kickstarter page first draft and we’ve a rough cut of the video too. I’ve written a press release and am about halfway through updating the website with changes reflecting the move to a limited company. I’ve also finally completed the bank account application for the limited company too. The next step is to get some eyes on the Kickstarter page and get some feedback and finish off the website changes and make those live. Finally, next weekend is Tabletop Gaming Live at Alexandra Palace in London. Paul and I will be there on Sunday (with FlickFleet and Zombology) and I’ll be repeating my hand-crafting seminar from 2-4pm. I’m hoping that with a bit longer I can answer more questions and make more of the game without having to rush the final bit. If you’re going, please come along and say hi! If you've been a reader of this blog for a while you'll know I'm very wary of Kickstarter. So why exactly are we Kickstarting FlickFleet? The short answer is we can't afford not to. Zombology has broken even now, but I've still a decent stock pile to sell through, and a large chunk of the money I've recouped on Zombology sales has been invested in FlickFleet development - I have less cash on hand now than I started with. And FlickFleet is a far more expensive game to manufacturing than Zombology. Zombology is just a card game with a box, 108 cards and a rules sheet. FlickFleet has acrylic ships, wooden bits, ship dashboards, dice, a rulebook and a box. 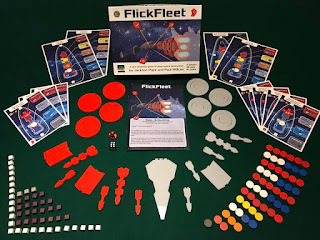 I think FlickFleet is the most fun and approachable of the six games I've published, but if there's one thing Reiver Games taught me, it's that I don't want to be getting a bank loan to fund a large print run of FlickFleet to find out I've judged it wrong again and I'm left with a big pile of stock and little money coming in while we haemorrhage money through warehousing costs and bank loan repayments. 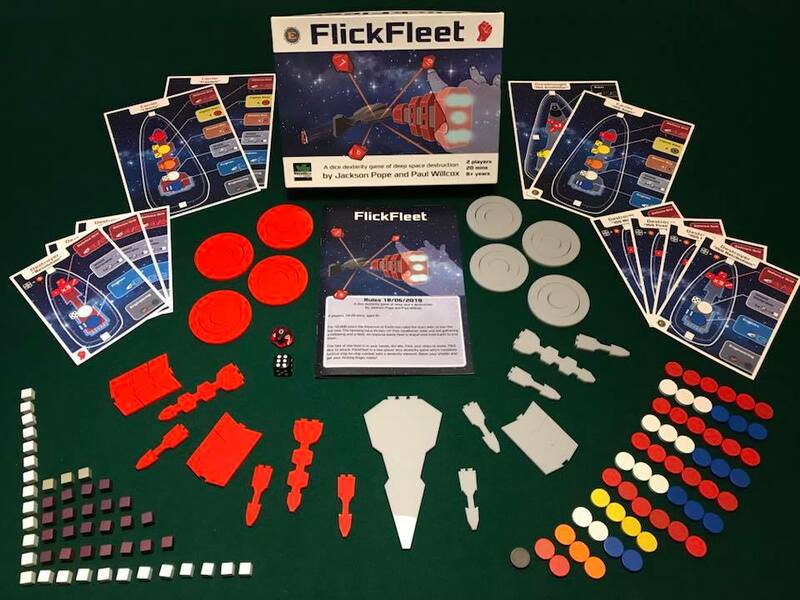 Kickstarter gives us a chance to judge the size of the market for FlickFleet and size our print run accordingly. It also lets us change the shape of the print run as the campaign becomes more successful. I'm hopeless at marketing, so my best guess is that we'll fund somewhere between 50% and 125% of our target. We're setting that low in an attempt to increase our chances of success - but that brings other challenges. To reduce the target to the minimum, we're aiming for a hand-crafted run of 500 copies (half the minimum order of our professional manufacturer). So to do this we'll need to pay the kickstarter cut, then buy the raw materials for 500 games and we'll need to do the laser-cutting ourselves, so we also need a laser-cutter. In the unlikely event that something miraculous happens and we're much more successful, the Stretch Goals are aimed at improving components for everyone (not adding in expansions and extra bits we haven't had time to properly test). And at some point the time and effort it would take us to make the hand-crafted boxes and dashboards, plus bag all the wooden components and laser cut the ships would be prohibitive - so we'll have to switch over to professional manufacturing (of at least the box, dashboards, rules and wooden bits - the status of the laser-cutting is still under investigation). Have you seen a kickstarter that switches from hand-crafted to professionally manufactured as a Stretch Goal? I’m back from my two week blogging hiatus! During that time I’ve had a week long holiday, an impromptu camping weekend and a visit from my FlickFleet co-designer, Paul and his family. 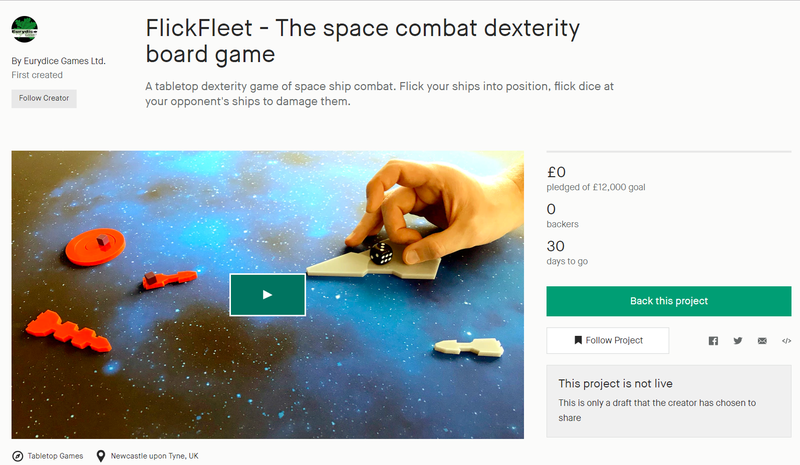 Progress on the FlickFleet Kickstarter has picked up in the last week, but in total has been slower than I’d like, hindered by some terrible nights’ sleep while The Toddler had bad cough and fever. But now that the holidays are over and The Toddler is on the mend, things are looking up. This weekend, during Paul’s visit, we discussed the kickstarter in some depth and then spent Saturday night with my mate Wilka taking some photos of the game and its components and recording the footage for the kickstarter video (with a new shorter script crafted minutes before Wilka arrived) and a videoed play-through of the game. The kickstarter page is taking shape finally, it’s mostly there now, pending a few images of the game, a few more reviews and some images for the stretch and social goals. I’ll be soliciting feedback on it shortly. We had hoped to bring it to Kickstarter last week, but we’ve clearly missed that. I’ve pushed it back to the 24th, but we’re not going to be ready for that either - so we’re now aiming for mid-October. Hopefully we’ll hit that one! But as everyone says, it’s better to wait until you’re ready than rush out a half-finished campaign to hit an arbitrary deadline you’ve given yourself.